Edna, Edna, Wake Up: Where Is South Africa's Conservation Leadership? Someone please wake up Edna Molewa, South Africa's Minister of Water and Environmental Affairs, as she is clearly sleeping on the job. For several years now South Africa has witnessed its white rhino population fall under siege to poachers. 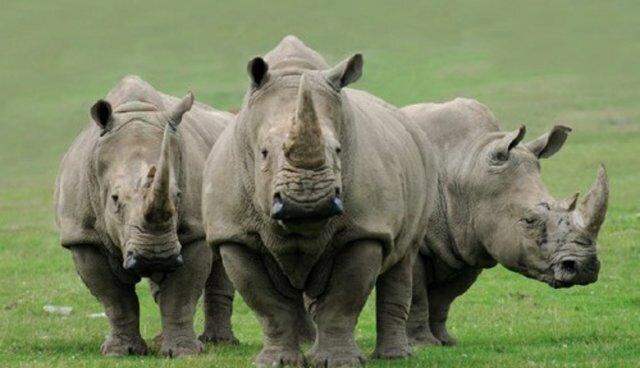 From 2000 to 2007, the average number of rhinos poached in South Africa was about ten per year. In 2008, however, the number increased 6.5 times to 83. This increase caused people to pause and express concern, but no one could have foreseen the full blown crisis that was to unravel over the next five years. The numbers increased year after year: 122 were poached in 2009, 333 in 2010, 448 in 2011, 668 in 2012, and a resounding 1004 in 2013. A little over halfway into the year, 618 rhinos have already been poached in the country. Molewa is not to blame for the onset of the poaching crisis, as she did not assume office until November 2010, but she must be held accountable for the country's continuing rapid increase in poaching numbers and its lack of efficient anti-poaching measures. Over the three years she has been in office, there have been scores of articles about the various methods that were supposed to combat poaching from employing drones in the air to riding horseback in the brush. While the effects of all these efforts cannot be quantified, it can be noted that the increase in poaching has increased significantly year after year under Molewa's tenure. A summation of Edna's tenure can be found in a sentence she uttered just a few weeks ago. On May 5, 2014 while addressing a crowd at the signing of an anti-poaching agreement with Mozambique and promoting her push toward opening the rhino horn trade, she stated that "we do think that it could [win the war on rhino poaching]... just taking it from the lessons we have learned from ivory. We did an ivory once-off sale and elephant poaching has not been a problem since." To be fair, it is quite possible that Ms. Molewa was specifically referring to the elephants of South Africa in her statement, which have been relatively safe since the one-off sales. The elephants from the rest of the continent, however, have not been so lucky. Such a statement, even if referring to the elephants of South Africa, is myopic and implies she has turned a blind eye to the elephant poaching occurring throughout the rest Africa. By not addressing the full scale of poaching, she is unable to comprehend the nuances of the ivory trade and therefore has not learned anything from the one-off sales. The opening of the ivory trade and the mismanagement of it by Chinese authorities has led to the present elephant poaching crises. Ms. Molewa needs to be aware that the one-off sales are not what has protected South Africa's elephants. That came from the country being stable and not having roving bands of militants killing its wildlife. In addition, there are no well established ivory networks such as those in other countries, and certain other factors make it is easier to kill elephants in other countries. It appears there is confusion over the word "crisis" amongst South African wildlife officials. Last week SANParks, the body responsible for managing South Africa's national parks, refuted claims that it is in a crises and losing the battle against rhino poaching. Its chairperson Kuseni Dlamini admitted the park system is facing an onslaught and is "fighting back and there are no crises." Losing 5% of a population of 20,000 in one year to illegal poaching is a crisis. It appears Dlamini suffers from the same debilitating ailment afflicting Molewa that prevents wildlife officials from seeing a crisis as it plays out before them. Molewa and Dlamini hold powerful positions that affect South Africa's wildlife. Troubles throughout the park system are emblematic of their denial of what is transpiring throughout the continent and within their country. Over the past two years, the headlines are indicative of corruption affecting the parks from top to bottom: SANParks Arrests Two Staff Members for Alleged Poaching, SANParks' Conservation Head Suspended, Son of Regional Field Ranger Implicated in Poaching, Elephant Mismanagement Prompts Hunting Permit Change(as two senior conservation officials are charged for issuing licenses to hunt females with calves), Kruger Park Rangers and Guides Arrested Over Rhino Poaching, Kruger Park Ranger Arrested Over Rhino Poaching, Two Police Officers and Former Ranger Arrested for Poaching (2012), Arrest of Former SANParks Ranger and Police Officials Welcomed (2014), SANParks Denies Allegations of Mismanagement. Stories such as these, along with the continuing high rate of poaching, indicate a lack of leadership from the top. In this case, the top is Edna. Ms. Molewa has illustrated in her comment that she is unable to comprehend the level of poaching occurring throughout Africa. The yearly number of rhino poachings has not only not been reduced by her; it has more than doubled, from 448 to 1004. This illustrates that she has not accomplished anything to reduce rhino poaching. Her insistence that the only option left is to open the rhino horn trade signifies her inability to devise and implement strategies to arrest the rhino poaching crises. That she has not spoken out about Dlamini's statement demonstrates that she concurs there is not a rhino poaching crisis in South Africa. All of this combined signifies Minister Molewa is sleeping on the job. For the sake of South Africa's wildlife, can someone please wake up Edna. Poaching and poaching arrest records found via Save the Rhino.